Abstract The world's largest laser system is the National Ignition Facility (NIF), located at Lawrence Livermore National Laboratory. NIF's 192 laser beams are amplified to extremely high energy, and then focused onto a tiny target about the size of a BB, containing frozen hydrogen gas. The target must be perfectly machined to incredibly demanding specifications. 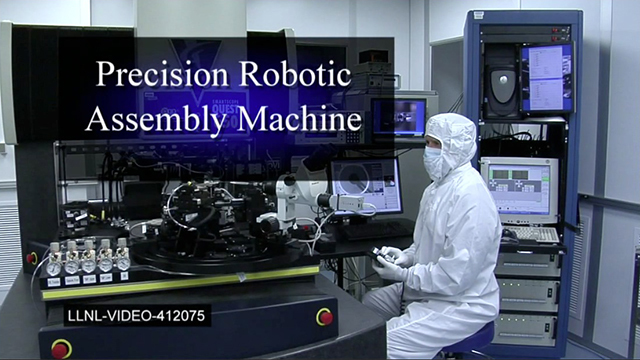 The Laboratory's scientists and engineers have developed a device called the "Precision Robotic Assembly Machine" for this purpose. Its unique design won a prestigious R&D-100 award from R&D Magazine.